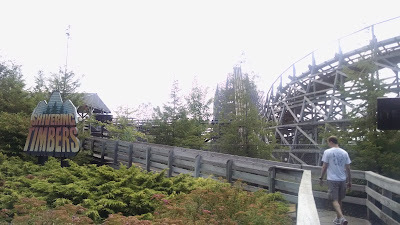 Shivering Timbers was the first ride we rode at Michigan's Adventure. It is a wooden coaster (which typically I don't ride, and especially don't ride first, but we had few choices here) and actually wasn't too bumpy for being wooden. It looked like it was the tallest in the park (125 ft) and had a big hill (122 ft). It's an out-and-back coaster and was fine. We didn't think it was anything special, although it has been ranked as one of the top 10 wooden coasters by readers of "Amusement Today".